I recommend only what I believe will support and guide you in your healing, growing and realizing your highest purpose. I spent the better part of two months sifting through about 20,000 holistic healthcare products - makeup, skin and hair care, supplements and herbs to find what I felt was safest, most nourishing and beneficial and good enough to pamper YOU in your self-care ritual. You can access the shop, here. Herbal medicine works well with modern medicine. Complementary medicine is one of the fastest growing areas of modern healthcare for good reason. It works. Herbal medicine has much less toxicity and fewer side effects than drugs. Statistically speaking, herbs are far safer than even properly prescribed drugs. Herbs are much more cost-effective in the short and long-term.In fact, some wild herbs are growing in your backyard right now for FREE! adopting herbal regimens, eating whole, organic foods, participating in physical activities and getting quality rest will very likely result in good health and fewer medical bills! Herbal medicine does not support industrial corporate profit-driven agendas. Growing herbs does not cause environmental devastation. 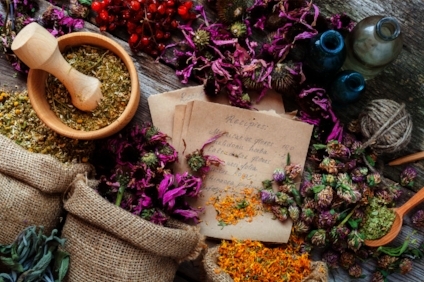 The history of Herbal Medicine stretches back thousands of years, and is the basis of all medicine practiced in the world today. The written history alone of Traditional Chinese Medicine and Ayurveda is at least 3,000 years old and formed the foundations of many healing traditions throughout the world. Practical data gathered for hundreds upon hundreds of generations of herbal healers offers sound clinical information about the efficacy of natural prescriptions. By partaking in the rich lineage of botanical medicine, we are linked back to the wisdom of our ancestors. Knowledge of Herbal Medicine secures our future by teaching the next generation how to survive. I’m not trying to be an alarmist, and I do hold out hope that humanity will rise above its baser instincts to create a sustainable culture, but as the saying goes, “Hope for the best. Prepare for the worst.” Learning and teaching the art of living in harmony with nature, as our ancestors once did, will ensure the survival of our species, come what may. If catastrophe befell us (and calamities seem to be happening so frequently these days), would you know how to find food and medicine in the wilderness? This is a very important question to ask yourself. Healing one’s self with herbs is very empowering. The knowledge and ability to relieve yourself of a myriad of common maladies without ever stepping foot out of your own home really encourages a sense of self-sufficiency and self-confidence. It’s actually pretty easy to naturally combat fatigue, get better quality sleep, ease pain, improve immunity, regulate menstrual cycles, adjust the bowels and thrive instead of simply survive. It is our birthright to have autonomy over our own health; I suggest that you not sell it to the lowest bidder. Using botanical medicines gently enhances emotional well-being. Essential oils, herbs, homeopathic remedies, and flower essences all help to support emotional balance without suppressing our tendencies to normal ebb and flow. When combined with wise counsel, personal issues can be navigated more easily and authentically than when we inhibit the healthy expression of our innermost feelings. Using living botanical remedies invites us to have a very personal relationship with our medicine. These herbs are recommended to supplement feminine repROductive health, STRESS REDUCTION AND ADRENAL SUPPORT as well aS emotional and hormonal well-being. I WILL BE PROVIDING INFORMATION ON EACH HERBAL SUPPLEMENT, ONE AT A TIME, VIA MY MONTHLY HARVEST AND IN MY NEWSLETTER. YOU CAN ACCESS THAT LIST as well as TONS of self-care products for PURCHASE HERE.